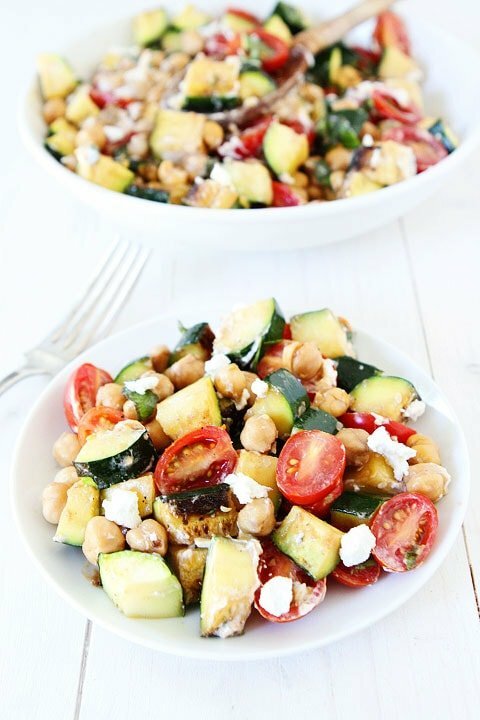 Grilled Zucchini, Chickpea, Tomato, and Goat Cheese Salad-this simple and healthy salad is perfect for zucchini season! A few weeks ago, I shared a recipe for Chocolate Coconut Zucchini Cake and thought about making it again with the plethora of zucchini we have, but I decided to make a salad instead. I have some baby weight to lose:). 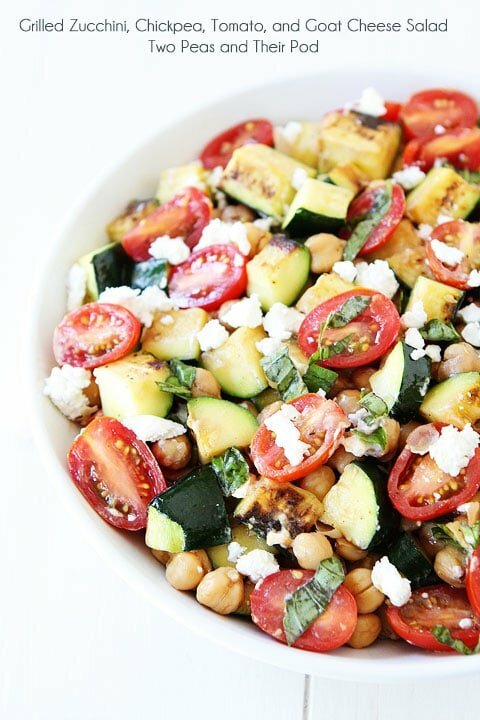 I know salad isn’t as exciting as cake, but I really love this Grilled Zucchini, Chickpea, Tomato, and Goat Cheese Salad. I promise it’s worth making! Maybe you can eat this salad for dinner and follow it up with the Chocolate Coconut Zucchini Cake. A double dose of zucchini sounds good to me! Grilled zucchini is so good! I love it! Plus, you don’t have to heat up the house. Just take the zucchini outside and fire up the grill! 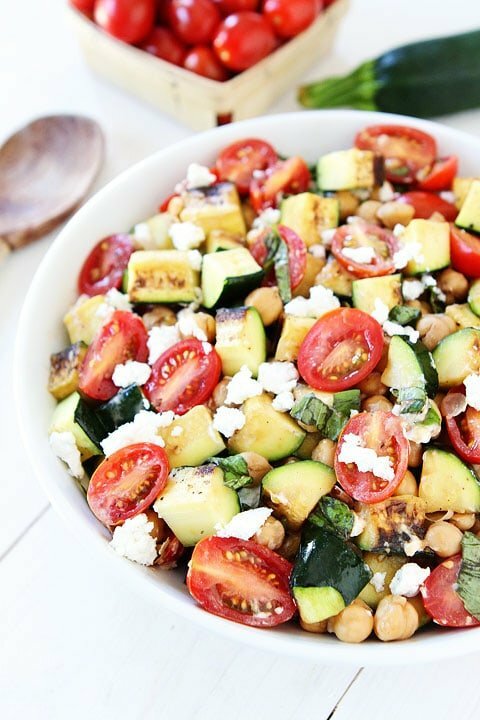 I combine the grilled zucchini with chickpeas, tomatoes, a splash of balsamic vinegar, goat cheese, and fresh basil. That’s it! This salad couldn’t be any easier! This zucchini salad is great served as a main dish or side dish. I ate it for dinner with a side of watermelon. It was the perfect summer meal! And if you aren’t crazy about goat cheese, feta cheese or Parmesan cheese would be good too, but I personally love me some goat cheese! If you are looking for more zucchini recipes, check out our favorite zucchini recipes! There are lots of good ones! This simple summer salad is perfect for using up your garden produce! Preheat grill to medium high-heat. Brush zucchini with 1 tablespoon of the olive oil. Season with salt and pepper, to taste. Place zucchini on hot grill and cook until charred and just beginning to soften, about 7-10 minutes. Remove from grill and let cool to room temperature. When the zucchini is cool, chop into pieces. 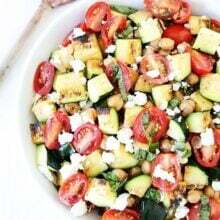 In a large bowl, combined chopped zucchini, tomatoes, chickpeas, the remaining olive oil, and balsamic vinegar. Toss. Add the basil and goat cheese. Gently stir and season with salt and black pepper, to taste. Serve. This has all of my faves. Goat cheese really puts this over the top and takes it from a salad to a meal! Such a great summer salad!! 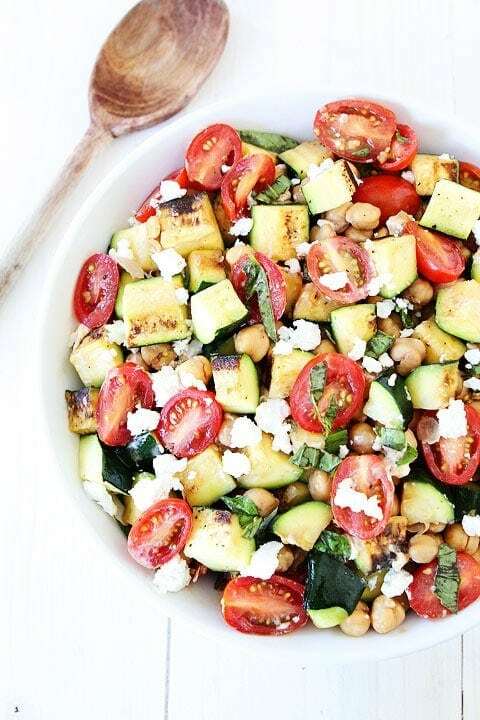 I love this combination- grilled zucchini is so delicious! Zucchini and tomatoes are exploding in my garden – thanks for another way to use both of them at the same time! I agree with Lauren – perfect summer salad! Love this salad! Grilled zucchini is the best! I have a zucchini sitting on the counter and this recipe is calling it’s name! Totally craving this right now! So delicious! Scrolling FB and I see this Beautiful salad. Looked at the ingredients and was Thrilled I had all the ingredients! (This never happens:) I did the only responsible thing, and made it right away. SO Fantastic! I just finished my bowl and I had visions of licking my bowl clean for every last bit of goodness. THANK YOU for a new family favorite! This looks so light and fresh and tasty! I love all that feta! It sure is the time of year when salad seems like THE best food choice for both lunch and dinner. But for those of us who like variety, we are always open to new combos. 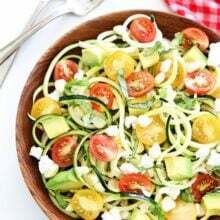 I have often used zucchini in salad, but not as the main driver of the dish. Great idea. My kind of dinner! 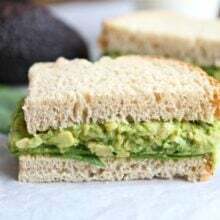 Or lunch, or anytime meal–it’s light, flavorful and so easy to make! 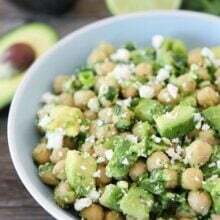 Anything with chickpeas or feta is delish! 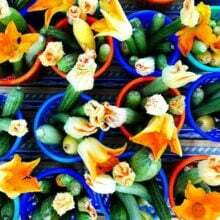 I can never have too many zucchini (or goat cheese) recipes! This one looks perfect!! 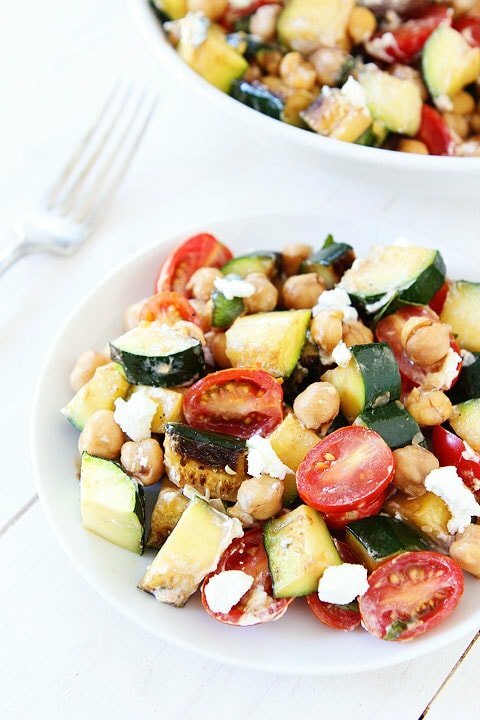 Chick peas, zucchini and goat cheese are three of my son’s favorites – I can’t wait to make this for him.